That's where we lose track of Lody and dozens of other sheltered animals apparently suitable for adoption, before they became lab test animals. The People for the Ethical Treatment of Animals has released a new Web feature about NUVAS and other animals like Lody, like Lulu, who was/is "Cute, cuddly and energetic," according to the NUVAS intake form, and "loves attention and being scratched." Lulu went in: March 27, 2010. Sold for experimentation: April 15. PETA obtained the intake records of over 50 animals from NUVAS, allegedly the only animal shelter left in Utah that sells its animals to the University of Utah for animal testing. PETA obtained photos and intake records of the animals, often containing glowing remarks about the dogs and cats, who were later--sometimes very soon--sold to the U.
PETA's Justin Goodman, the associate director of lab investigations, says animal shelters selling animals to labs is shady. "Not only is this shameful betrayal of the cats and dogs that rely on our goodwill for their protection, it's also a violation of of the trust of the public who expects shelters to be a safe haven for vulnerable animals, not a supplier of cheap lab 'equipment' for animal experiments," Goodman said. I called NUVAS and was told director Tug Gettling is the only person who can speak on behalf of the shelter. He's unavailable until Monday. If he calls with comments next week, I'll update the post. Goodman says PETA has been in contact with Gettling, who "has not indicated that he plans to change the policy," and board members of the shelter, some of whom "told us they had no idea the shelter was doing this and asked for more information." PETA is asking for concerned individuals to "respectfully urge" NUVAS board members to end the practice. They have a form on the Website to help you do so. As the result of 2010's HB107, sponsored by Salt Lake City Democrat Rep. Jennifer Seelig and co-sponsored by Provo Republican Sen. Curtis Bramble, Utah shelters are no longer forced to sell their animals to research laboratories but may continue to do so if they wish. According to PETA, all of Utah's shelters have chosen to end the practice except NUVAS. 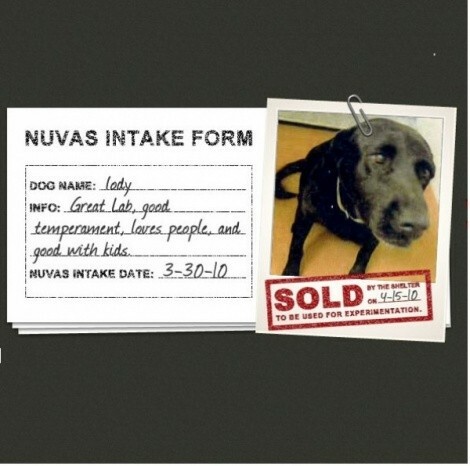 Update 2:40 p.m. 9-3-10: Click here to browse the adoptable animals available from NUVAS. Update 11:02 a.m. 9-6-10: This weekend I met Kappa Gamma, a lovely and happy black lab who enjoys hiking and playing with young kids. I met Kappa Sunday atop Gobblers' Knob (elv. 10,246 ft., the highest point between Millcreek and Big Cottonwood Canyons). 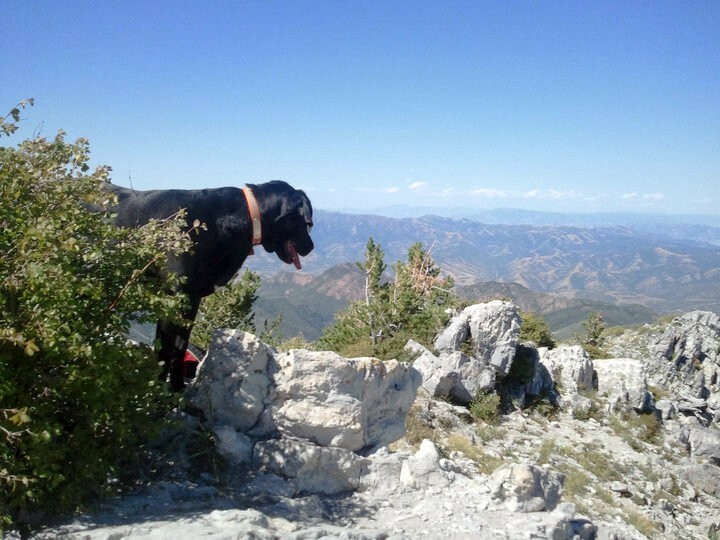 Kappa was a University of Utah "lab research rescue animal," according to his human friends. While in the lab, Kappa had electrodes surgically and semi-permanently implanted along his spine to research how his spine worked while running. These were apparently visually obvious while implanted, but were removed at the termination of the study. Kappa suffers no permanent injury as a result of the electrodes and is living a very nice retirement, according to his human companions. Additionally, Kappa's name was given to him in the lab and because he was already familiar with it, his adoptive family continued to refer to him that way. I'm not an animal pyschologist, but this, to me, suggests Kappa received a level of socialization that contrasts most people's concept of what it means to be a lab test animal. But, as members of the Animal Defense League of Salt Lake City remind us, not all lab animals get off so easy. "Some of the dogs and cats sold by animal shelters to the university have holes drilled into their skulls, medical devices implanted in their necks, and hard plastic tubes repeatedly forced down their throats." Or as Jessica Clark commented on Facebook, "...my mom's neighbors rescued a testing dog from the U. It's a mess. Scared of everything. Super sad." Level A: Animals will be purposefully exposed to a pathology (like HIV), permanently disabled (like inducing a stroke) or subjected to extreme emotional stress (pain studies, etc). Most or all the animals will suffer and/or die as a result of the experimentation. Level B: Animals will not be exposed to any permanent physical health problems, but will suffer greatly during limited times during the course of the experiment (like recovery from a surgery). Complete recovery in the long-term is possible, though stress-induced emotional problems are a likely risk. Level C: Animals will not suffer much physical or emotional stress as a direct result of experimentation (like Kappa Gamma's experience seems to have been) and human safety protocols must be followed for all procedures. The animals will receive ample socialization on a daily basis. Then what do you do with the classifications, in terms of limits, bans or other regulation? I'll leave that to others to propose. I'm primarily concerned with transparency and information dissemination. My bias here is that there is inadequate information regarding the care of animals in lab research facilities. I'd like to see that change. After all, I imagine some people reading this might be willing to picket and protest a Level A animal experiment but would be very much in favor of Level C. Those people, I believe, have a right to know who's doing what--and how often.